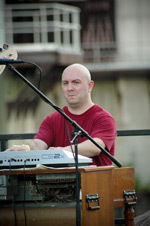 Jason Panucci is an organ/keyboard player from upstate New York creating music reminiscent of the 60/70’s Soul Jazz era.Heavy influenced by Dr. Lonnie Smith,MMW,Robert Walter,Grant Green. He also has produced for many Hip Hop artists including a remix for the “Sexiest DJ in the World” DJ Sassy Pandez. Currently 1/2 of the Electro-Funk duo "Beatdown Collective"
Jason is currently in the studio working on “Yeah, That’s the Stuff”. Its a tasty collection of heavy organ grooves, gritty Soul-Jazz,Funk-Hop and Chill/Electronica tracks. Guest include Michael Newman and Jeff Nania on sax, Dave Spadaro on guitar and The Vinylcologist cuts/beats.